Founded in 1970, Welltower (WELL) has grown to become one of America’s largest medical REITs. The company owns more than 1,600 properties across the U.S., Canada, and the U.K., but 83% of its real estate investments (and rent) are from U.S. properties. The company's properties serve over 300,000 residents and are essentially involved in every aspect of patient care, from hospitals and long-term skilled nursing facilities to senior assisted living communities and medical office buildings. The REIT's outpatient properties see about 15 million patient visits per year. Over the past decade, Welltower has steadily reducing its reliance on government funding (i.e. Medicare/Medicaid). Today 94% of the company’s revenue comes from private payer insurance sources compared to 69% in 2010 and 84% at the start of 2014. Tenant diversification has also improved, with its three largest operating partners accounting for 29% of net operating income, down from 40% in 2014. Welltower's largest operator (Sunrise Senior Living) accounts for about 15% of income; no other operating partner accounts for more than 7%. Welltower has paid uninterrupted dividends for 48 straight years and grown its annual payout for eight consecutive years. While the firm did freeze its dividend during the financial crisis, it was able to avoid a payout cut unlike the dozens of REITs that had to cut or suspend their payouts as credit markets locked up. One of the keys to any reliable high-yield investment, especially REITs, is a secure and consistent source of cash flow. In the case of Welltower, this cash flow security comes from very well staggered and diversified rental lease agreements, with an average remaining length of about 10 years. In addition to only having to renegotiate 1.5% to 2.5% of leases in any given year, Welltower’s tenant base is diversified across some of the industry’s largest names, such as Sunrise Senior Living and Brookdale. This helps ensure that the company’s portfolio of tenants can collectively continue making their rent payments in full and on time. Though Welltower is America’s largest medical REIT, it only owns less than 3% of the $1.5 trillion U.S. healthcare real estate market, meaning there is still plenty of room to grow in this highly fragmented industry. Welltower has historically been a large-scale property acquirer, buying more than $30 billion in new properties since 2010 to roughly quintuple the size of its portfolio. However, in recent years Welltower made the decision to temporarily slow its pace of new property purchases in order to adapt to challenging market conditions, improve the quality of its existing portfolio, and strengthen its balance sheet. Between 2014 and 2018 the REIT made $12 billion in acquisitions versus $14 billion in asset sales. Over that four-year period, 24% of Welltower's entire asset base was recycled into higher-quality and more financially sound properties, according to management. Approximately 53% of the properties Welltower sold were struggling skilled nursing facilities (SNFs), with a focus on shedding exposure to those run by distressed SNF operator Genesis Healthcare (GEN). While these divestitures resulted in Welltower's adjusted funds from operations per share declining by 4% and 6% in 2017 and 2018, respectively, they appear to be a smart move in the long run for a conservative REIT. Simply put, the skilled nursing industry is currently experiencing major challenges that cloud its long-term outlook. For one thing, the Center for Medicare & Medicaid Services (CMS) has instituted a number of reforms since 2010 affecting how Medicare and Medicaid reimburse healthcare providers, including shorter patient stays and lower reimbursement rates. Combined with higher regulatory compliance costs and rising labor costs in the medical industry as a whole, many SNF operators are struggling with thin margins and having difficulty covering their full rental costs. Senior housing that’s operated under a triple net lease model (close to 20% of Welltower's cash flow), meaning the tenant pays all maintenance, insurance, and taxes, has also faced some challenges, largely stemming from excess industry supply. Management has done some pruning of its portfolio here as well to address the firm's troubled leases. Thanks to its strategic dispositions of certain underperforming facilities in recent years, Welltower reduced its exposure to operating partners Genesis Healthcare and Brookdale, one of the company's largest senior living operators, from 22.1% of net operating income to just 7.9%. Management has instead focused more on investing in senior housing that it operates itself and extending leases with its strongest tenants to stabilize its future cash flow.. Thanks in part to these moves, which reduced Welltower's fundamental risk profile, the company's leverage metrics have improved across the board. As a result, Moody's, S&P, and Fitch have all given the company an investment grade credit rating (BBB+ or equivalent) with a stable outlook, providing the firm with easier access to low-cost capital (the REIT has no major debt maturities until 2023 as well). With a stronger portfolio in place, Welltower is back to trying to achieve cash flow growth by balancing its selective asset sales with large property acquisitions. Perhaps the most notable deal was announced in April 2018 when Welltower reached a deal to acquire Quality Care Properties, a small and struggling SNF-focused REIT, for $2 billion. 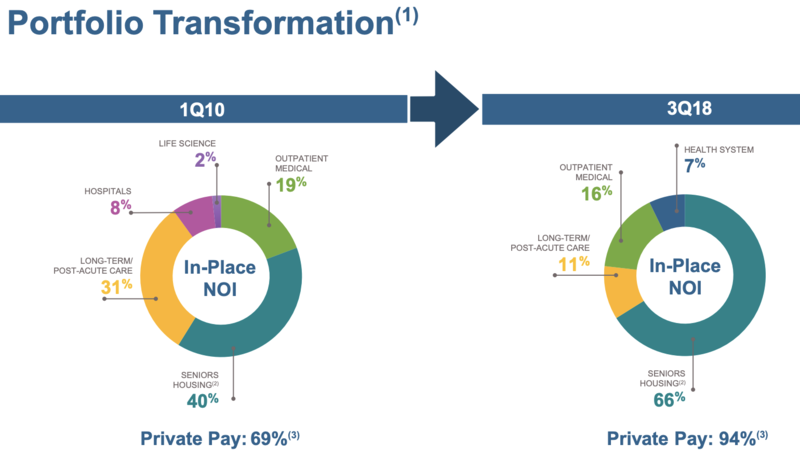 HCP (HCP) spun off Quality Care to shed its own struggling SNFs, especially the ones run by HCR ManorCare, which went bankrupt in 2018. Why would Welltower, which in recent years has sold underperforming skilled nursing facilities, spend billions of dollars to buy new ones? Acquiring Quality Care actually fits with the REIT's long-term consolidation strategy. While many SNF operators are struggling (thus the need to sell off some of their facilities), Welltower is partnering with non-for-profit medical operator ProMedica, which will be the tenant of the Quality Care properties it keeps. ProMedica has agreed to invest $400 million over five years to upgrade the facilities and signed a 15-year triple net lease with Welltower that covers all of these facilities. The partnership between Welltower and ProMedica, the first of its kind in the industry, will create one of the largest non-for-profit SNF chains with a rental coverage ratio (operating cash flow/rent) of 1.8. For context, 1.3 or higher is generally considered safe in this industry. Simply put, Welltower is using its managerial experience and access to low cost capital to continue buying select SNF assets, keep just the best ones, and then ensure that the ones it retains will have industry-leading financial health and generate steady cash flow for the foreseeable future. But Welltower's long-term growth strategy isn't just about consolidating the best assets in the struggling senior housing and skilled nursing industries. 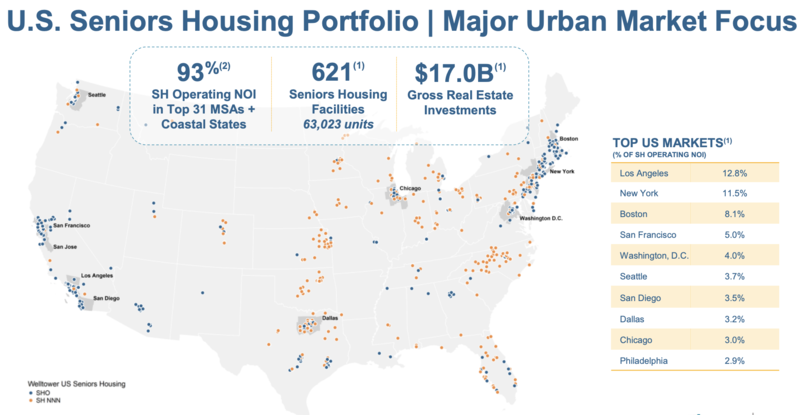 In December 2018 the REIT announced plans to invest $1 billion into 11 senior housing and medical office buildings with average cash yields of 6.4% (high for quality properties). This continues Welltower's recent strategy to diversify into medical office buildings, or MOBs, including a $400 million purchase of 23 such properties announced in October 2018. Medical office buildings are generally leased to doctors or medical systems (run by hospitals often associated with universities) and thus tend to have much higher rental coverage ratios, lower reimbursement risk, and significantly better visibility compared to SNFs. The 23 MOBs that Welltower purchased are on average 10 years old (young with low maintenance costs), located in 12 major metro areas, have 94% occupancy, and are 96% leased to major regional healthcare systems. Most recently, in January 2019 Welltower announced a $1.25 billion deal to acquire 55 MOBs and outpatient facilities from CNL Healthcare Properties. These properties have a 94% occupancy rate, and 92% of them are leased to premier health systems that are financially strong with 90% of them having investment grade credit ratings. Despite these diversification efforts, you might have noticed that Welltower's exposure to certain struggling industries, such as senior housing, has actually increased over the years (to 66% of net operating income). However, the firm's exposure here is not as risky as it might seem at first because Welltower’s company-run senior housing facilities are not only younger than the industry average, resulting in lower maintenance costs, but they are also located in faster-growing and more affluent urban locations. Specifically, 93% of those facilities are located in 31 of America's largest cities. Around 40% of the REIT's senior housing net operating income comes from five cities (Los Angeles, New York, Boston, Washington D.C., and San Francisco). These are all affluent areas where new senior housing construction is often more challenging due to zoning laws. This results in higher occupancy rates and stronger tenants due to less oversupply risk. Simply put, Welltower’s overall portfolio of senior housing properties appears to be high quality, with below average property ages, above average affluence, strong occupancy, faster population growth, and solid same-store revenue and net operating income (NOI) growth compared to industry benchmarks. Thanks to these advantages, plus higher barriers to entry in urban markets, management estimates that new supply in a 5-mile ring around its senior living properties potentially impacts just 6.3% of Welltower's total net operating income. In other words, the firm's portfolio appears to be nicely positioned to endure the industry's current growth challenges while investors wait for the tailwind of an aging population to kick in. 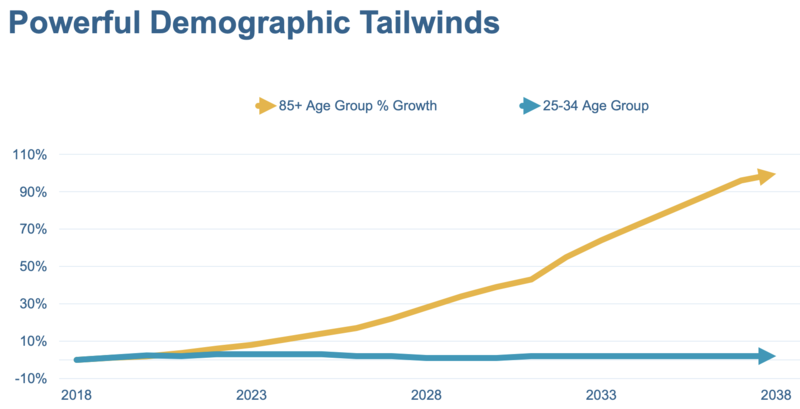 As you can see, the U.S. population of people who are 85 years of age or older is growing four to nine times faster than the overall population in Welltower’s markets. As a result, a substantial increase in demand for medical operations and treatments is expected, but also for senior housing units. Overall, Welltower’s management has an excellent track record of steadily growing both the REIT's cash flow and dividend over decades, in both challenging and fast-changing medical environments. Given the significant demographic trends coming over the years ahead and management’s moves over the past decade to improve the company’s portfolio quality while reducing reimbursement risk, Welltower appears to be positioned to take advantage of solid growth in overall medical spending. While there is a lot to like above Welltower, there are nonetheless several major risk factors to be aware of. The biggest long-term concern is arguably with the major growth that’s projected in U.S. medical spending. While this creates a large opportunity for Welltower, it also serves as a double-edged sword. 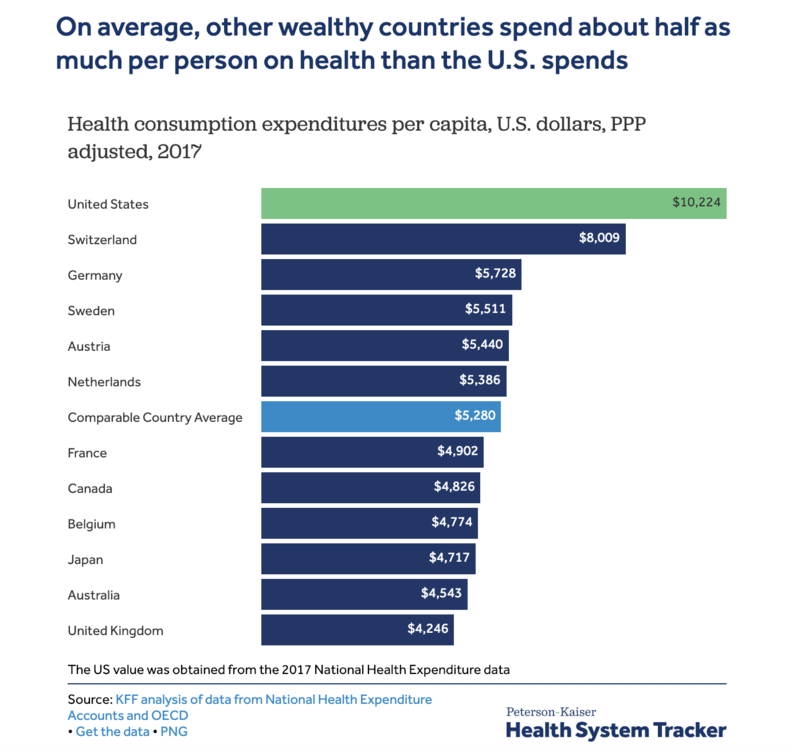 That’s because U.S. medical costs have been rising far faster than inflation for so long that medical spending per capita in America is by far the largest in the world. 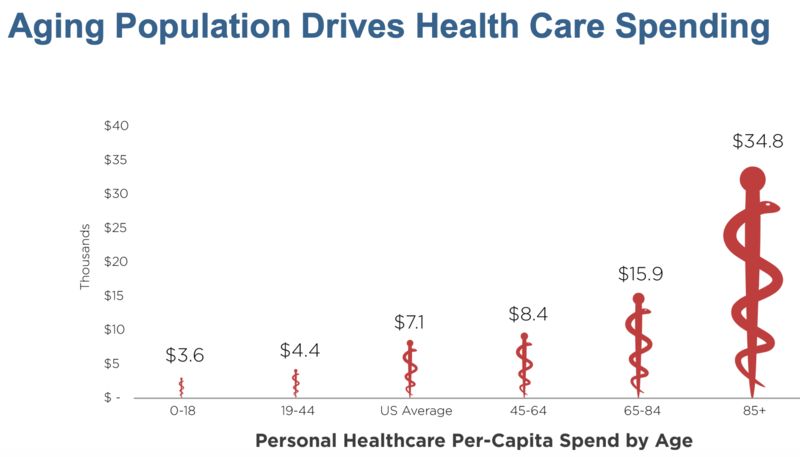 Since the vast majority of medical spending per American occurs at the end of life, governments and insurance companies are desperate to squeeze every last drop of savings from the current medical system before the onslaught of aging citizens fully strikes. As a result, this naturally creates a large deal of uncertainty regarding how health care spending will be managed in the coming decades. While it’s true that 94% of Welltower’s revenue is from private payer (i.e. non-government) sources, that doesn’t mean the company might not face margin-compressing price pressure at some point. After all, health insurance companies are just as eager as governments to minimize costs. In addition, there is always the risk that, should the U.S. move to a single-payer (i.e. government run) healthcare system, private insurers currently paying Welltower could be squeezed out. While a single-payer healthcare system in America seems unlikely and would presumably be many years away, a more immediate risk to Welltower's short-term results is the ongoing headwinds in senior housing, which remains the firm's biggest business driver. This combination of challenges is why, in the third quarter of 2018 Welltower's average rental coverage ratios for its triple net lease senior housing (19% of net operating income) and SNF facilities (11% of net operating income) were just 1.08 and 1.35, respectively. For those industries we prefer to see ratios of at least 1.2 and 1.3, respectively. In other words, despite the firm's focus on higher quality properties and its lack of exposure to changing government health policies, parts of its business could still be performing better. Fortunately, the supply headwinds providing most of the challenge to senior living operators could be diminishing soon. 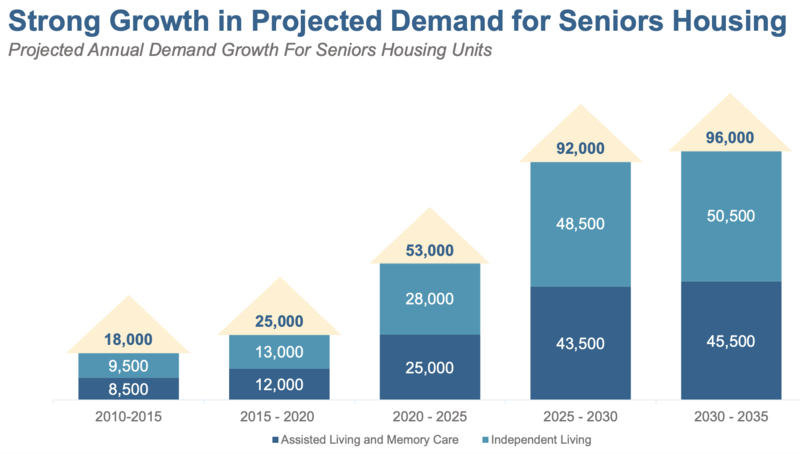 Per the National Investment Center for Seniors Housing & Care (NIC), the fourth quarter of 2018 registered "the highest increase in occupied senior housing units since NIC began to report the data in 2006." So hopefully the worst is behind Welltower, and its senior housing metrics will improve. With close to 40% of its senior housing revenue derived from just five tenants, several of whom are struggling, an uplift in the industry's occupancy rates and rental growth rates would be an especially welcome development. Welltower's client concentration in this business seems unlikely to threaten its dividend safety, especially given the firm's overall financial health. However, it could lead to future cash flow interruption should one or more of these tenants need to renegotiate their rental agreements for financial reasons, or if Welltower has to ultimately sell more underperforming facilities. In fact, Welltower is guiding for $800 million in property disposals for 2019, compared to $1.5 billion in acquisitions. Fortunately, with an expected positive net yield spread on its asset sales, those proceeds should ultimately result in higher cash flow to support ongoing safe dividend growth as management reinvests the capital. These asset sales will also help Welltower maintain a strong balance sheet with the REIT expecting its leverage ratio to fall from 6.0 to 5.7 by the end of 2019, about in line with its peers. Management expects cash flow per share to grow around 4% in 2019 as well, which will hopefully lead to a return to 3% annual dividend growth as industry fundamentals continue stabilizing in the years ahead. Welltower operates in challenging, price-sensitive markets that face a number of uncontrollable risk factors. However, management's conservatism and recent moves to further improve the company's portfolio quality and balance sheet have positioned Welltower to remain a force in the industry as it waits for one of the largest demographic trends to play out in the years ahead. As the biggest and one of the best-managed players in this industry, plus with a history of paying uninterrupted dividends since 1971, Welltower seems to be a sensible candidate for conservative income investors who are comfortable with the uncertainties faced by the medical real estate sector.